I have been selling on Etsy now for almost 3 years. I have a shop for my simple pieces of silver jewellery (all profits of which go to charity) and a shop for my 'hug in a box' gift hamper business, BearHugs. While the vast majority of my BearHugs sales now come through my own website, I do still sell on Etsy. 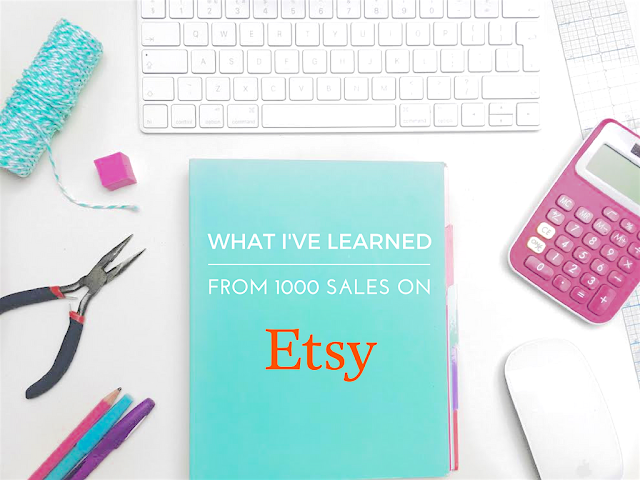 I was very excited to realise recently that I had cumulatively made over 1000 sales through Etsy alone. One of the loveliest things about selling on Etsy is the lovely people who buy from the site. Often the people who have chosen to visit Etsy are people who have actively made the decision to support small independent businesses over huge highstreet chains. I've always found being extra friendly is a nice way to say a little thank you for the choice that they've made. Sending a cheery message or a quick update on their specific order before it goes out is an easy way to give the customer added value that they may not get from big global brands. Etsy allows you to add 'tags' to every listing. This is where you can put the keyword phrases people may search for to find your items. Leaving any of these tags unused is a wasted opportunity as they can be very helpful in getting people to your shop when they search on the site. I have found that it's useful to think about what I might type into Google if I were looking for one of my specific products. The Google Keyword tool is useful to pick out keyword phrases too. I've found it's better to make the keyword phrases as niche as possible. A tag like 'silver button necklace' is going to be far more effective than just 'necklace' as it will face less 'competition' when Etsy is deciding what to display in its search results. A very simple thing that customers often remark on and provide positive feedback about is when I've sent a personalised handwritten note in with their order. It only takes a minute to do but again makes the customer's experience friendlier and a lot more personal. While reviews are important, I've found it's best not to fixate on them too much. Nothing beats a lovely review appearing on your shop page when you've worked extra hard to make the order perfect. Sometimes though reviews can be surprising- someone might have sent you a glowing private message about how happy they are but then given a 3 or 4 star rating. Everyone uses the rating system differently and I've learned to take it less personally if the star rating doesn't match the person's comments. You could have the most accurately described listing in the world with the clearest photos for the most beautiful high-quality product but still not meet the expectations of a given customer. It's best to not get too hung up on these cases. On a couple of occasions I've genuinely messed up, I've found it's always best to put my hands up when this is the case and apply the 'be friendlier than necessary' rule. Some of my nicest reviews have come from going further than necessary to resolve a problem. The lighter and brighter and more interesting my photos have been, the more views my listings have got. I don't have a fancy camera and I'm sure my photos could be improved upon but apps like 'Afterlight', 'FaceTune' (for whitening) and 'Camera+' have helped my amateur pictures taken on an iPhone along a lot. I've also found it's best to optimise on bright days and tend to take all my photos in batches. Just as I've found putting my keyword phrases in tags to be useful, I've also found it useful to put them at the beginning of listing titles. Not only does this help Etsy direct people to your items when they search on the site but it helps the customer themselves quickly identify what it is your selling. A little while ago I added a day or two to all of my delivery time estimates (other than Next Day delivery). This small change has had a really positive impact on my feedback from customers. More often than not they have been pleasantly surprised when their item arrived earlier than they expected and commented on this in their reviews. Adding a few days also accounts for any delays in the post- I've found this especially important at Christmas time. Turning on the 'Request Custom Order' button has been a lovely way to get to know some of my customers and make extra special items for them. I love it when someone shares the backstory to their specific request and it's extra satisfying making something one off and personal. Not only is it satisfying to put together one-off special orders but it also often results in great feedback and loyal customers who recommend you to friends or come back time and time again.